Harry D. Norton Jr. | Westwood, NJ--Pascack Valley Blog. Tag Archives: Harry D. Norton Jr.
Upper Saddle River Police are Targeting Jews. Unlike most North Jersey municipal courts that are disproportionately filled with various minority defendants who are mostly black and hispanic, the Upper Saddle River (USR) Municipal Court (New Jersey) is filled with JEWS. Need proof? Head over to the USR Municipal Court which meets the second and fourth Tuesdays of each month at 5:00 pm. How does this happen? It seems likely that the USR police department is targeting and ticketing Jews who drive through the municipality. How can the USR cops know that a motorist is a Jew? Just go to court, they’re easy to spot. 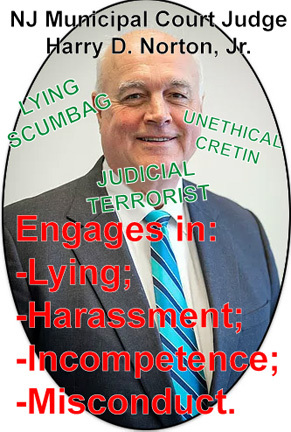 All of this implies that the USR police chief Patrick Rotella, USR municipal court judge Harry D. Norton Jr., municipal court prosecutor Michael Kingman, and the boro council who employs the aforementioned are all complicit in this racial/religious bias targeting. If you are a Jew driving through Upper Saddle River, NJ, you should know that you have a giant target on you. You might want to avoid driving through USR. The aforementioned USR people/entities are turds.